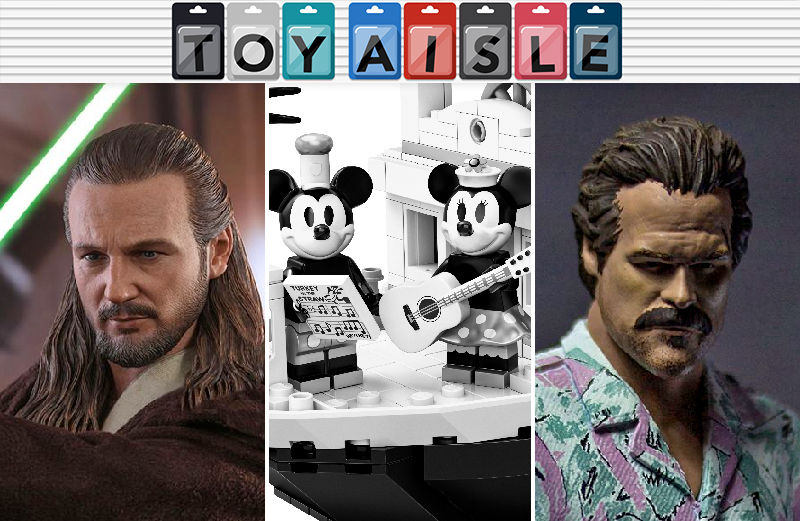 Welcome back to Toy Aisle, io9's regular round up of the most seaworthy toys we’ve seen online this week (please don’t actually attempt to float a Lego Steamboat Willie). This week: Hot Toys shares a surprise to be sure, though it’s a welcome one; Stranger Things’ hot new mall gets some hot new figures; and more. Check it out! In 1928, Mickey Mouse made his debut in the first animated Disney film to have sounds synchronized to the actions and characters in the movies. Neither Mickey nor sound effects have lost their popularity in the 90 years since, and Lego is celebrating that milestone by bringing a black-and-white replica of Steamboat Willie from its Lego Ideas platform to store shelves starting on April 1. (No foolin’!) Ninety bucks gets you the 751-piece set which includes old-timey Mickey, Minnie, and a paddlewheel boat with moving steam pipes and a working crane on the back. Even if you don’t care for the mouse, this set will add a nice assortment of black and white pieces to your Lego collection. It’s hard to believe it’s been 20 years since The Phantom Menace stumbled into theaters. But instead of fanning the flames on the debate over which is the worst trilogy—the Star Wars prequels or the more recent outings—let’s all agree that Hot Toys has done a fantastic job on this aging Orlando Bloom/Liam Neeson as Jedi Master Qui-Gon Jinn figure. It’s further proof that even 12-inch figures should never, ever try to use real hair fibers, as the plastic sculpt on Qui-Gon’s flowing locks is just perfect. Bonus points are added for a matching tiny lightsaber that actually lights up, and the inclusion of a blurred lightsaber in motion for action poses. It’s expected to arrive in early 2020, though, just in time for TPM’s less impressive 21st anniversary. You can never have too many Geiger-inspired creatures perched over your desk, so NECA is adding this majestic Queen to its seven-inch Alien line, based on its appearance in Alien: Resurrection. So that it’s accurately scaled to the rest of the figures, this Queen is an impressive 15 inches tall and 30 inches long. Massive figures like this are often difficult to balance and pose, but with over 30 points of articulation and an included display stand, it won’t end up in an awkward stance just so you can ensure it doesn’t topple onto your keyboard. Available July 2019.